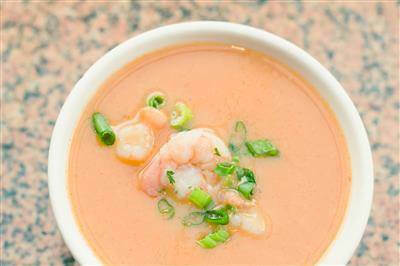 RecipeSavants.com This easy seafood bisque recipe is full of the savory flavors of the sea – including lobster & scallops. It is also incredibly rich with the addition of heavy cream. The additions of dry white wine, cognac and a generous amount of fresh herbs and spices only elevate this dish further. This is a restaurant-style soup that you can easily make at home. Smart Recipes, American Recipes, Seafood Recipes, Recipes Seafood American Seafood Bisque With Lobster & Scallops PT45M Serves 12 Ingredients: 2 Cups Dry White Wine 1 Bay Leaf 1 Small Onion 1 Leek 0.33 Carrot 2 Cloves Garlic 2 Pounds Lobster 2 Cups Water 12 Sea Scallops 4 Cups Heavy Cream 1 Cup Whole Milk 1 Teaspoon Dried Thyme 1 Teaspoon Dried Rosemary 1 Tablespoon Fresh Parsley 0.5 Teaspoon Salt & Freshly Ground Black Pepper 1 Teaspoon Fresh Lemon Juice 0.25 Cup Cognac In a large Dutch oven, combine the white wine, bay leaf, onions, celery, leeks and garlic and bring to a simmer. Stir in the lobster and cook, covered for 10 minutes. Remove lobster and set aside. In the Dutch oven, add the water and bring to a boil, and reduce to a simmer. Stir in the scallops, and simmer for 3 minutes. Remove scallops and set aside. Remove lobster meat from their shells and chop into bite-sized pieces. Set aside. Add lobster shells back into broth and simmer for 30 minutes. Using a cheesecloth & colander, strain the broth, discarding any solids collected in the cheesecloth and return the broth back to the Dutch oven. Stir in the heavy cream, milk, and herbs and simmer for anohter 10 minutes. Stir in the reserved lobster and scallops, salt & pepper and simmer for 2 minutes, or until the seafood is up to temperature. Stir in the lemon juice and cognac and serve. If you enjoyed this bisque recipe, you'll love these fresh ideas! Here is another filling soup recipe that is either a great first course or starter. 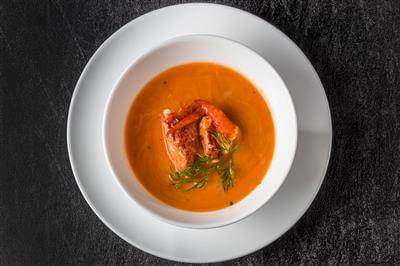 This bisque is loaded with jumbo prawns, vegetables, cream and a touch of cognac and is a perfect recipe for a fast weeknight meal. Pair with a simple green salad and a hearty slice of garlic bread. Surprise your family and make them feel pampered making this amazing bisque which is remarkably easy too. Serve with French bread to sooth up gloomy nights. 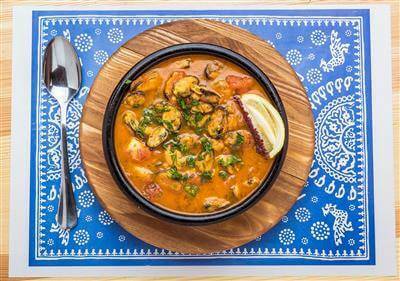 This easy Spanish seafood chowder is a delicious combination of salted pork, mussels, clams, prawns, mixed vegetables, blended spices, and amontillado sherry. This soup is great for a quick and healthy weeknight meal idea!